Palestinian supperclub Zaad Dinner Club is holding three Saturday dinners in April and May 2017, and three venues across South East London. On 22nd it's at Space at 61 in SE15, on 29th it's at The Good Hope Cafe in SE13, and on 6th May its at The Archie Parker in SE23. Tickets for all events are just £35. 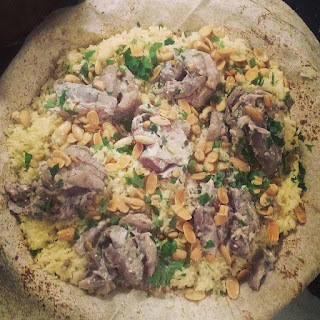 Mansaf is a Bedouin dish most famous in Jordan and Palestine, it is the national dish of Jordan and very popular among Palestinians everywhere. It is a lamb stew cooked in Jameed, a distinctly flavoured cured and dehydrated goats yogurt. It is served on a bed of turmeric rice and paper thin bread (Shrak) and topped with roasted almonds and parsley. It is such a feast of a dish and no celebration or special occasion is ever complete without it, whether it is a wedding, birth, graduation or funeral, Mansaf always tops the tables!"